The drama in the Rajya Sabha showed that the UPA government was not willing to go even by the will of Parliament. This gives rise to fundamental questions about the functioning of Indian democracy. The year 2011 will be remembered in India as the year of the campaign against corruption and for the Jan Lokpal Bill. The campaign began in January 2011 in the backdrop of the publicity that accompanied the several mega-scams that surfaced in 2010, notably those relating to the Commonwealth Games and the telecom spectrum allocations. It caught the public imagination with Anna Hazare‘s fast at Jantar Mantar in New Delhi in April 2011. That forced the UPA government to constitute a joint drafting committee for a Lokpal bill. The civil society representatives in the committee proposed a bill called the Jan Lokpal bill, which became the basis for discussions. The basic principles on which the bill was drafted were culled from the United Nations Convention against Corruption, which required all countries to put in place anti-corruption investigative agencies that would be independent of the executive government and would have the jurisdiction to investigate all public servants for corruption. The Jan Lokpal Bill thus provided for the selection of a 11-member Lokpal by a broad-based selection committee (comprising the Prime Minister, the Leader of the Opposition, two judges selected by all the judges of the Supreme Court, the Comptroller and Auditor General, the Chief Election Commissioner, the Central Vigilance Commissioner and the previous three chairpersons of the Lokpal), through a transparent process. It sought to bring the anti-corruption wing of the Central Bureau of Investigation (CBI) under the Lokpal’s administrative control. The Lokpal was to be given corruption investigative jurisdiction over all public servants (including Members of Parliament, judges and all sections of the bureaucracy), and those who may have abetted their acts of corruption (including corporations or non-governmental organisations). The Lokpal could recommend the removal of those officials who were charge sheeted for corruption and order the freezing of any assets that seemed to be acquired by corrupt means. The Bill sought to provide that corruption trials would be put on the fast track and the courts would determine the loss caused to the public exchequer by an act of corruption — which would be recovered from the corrupt public servants and their abettors. It provided for citizens’ charters to be framed by all public authorities, which would provide for time-bound delivery of public services; failure to do so would be actionable at the hands of officers working under the Lokpal. The bill required States to have Lokayuktas (covering State government officials) on the same lines as the Lokpal. In order to ensure the integrity of the Lokpal institution, several layers of accountability were sought to be built into its working. Its functioning was made totally transparent by means of a requirement to put every detail of its investigations on a public website after the completion of investigations. The CAG was required to do an annual financial and performance audit of the functioning of the entire Lokpal institution. Any citizen could make a complaint against any member of the Lokpal to the Supreme Court, which had the power to order his or her suspension and even removal. In addition, there were other important, anti-corruption provisions in the Jan Lokpal Bill. It required every public authority to give out contracts, leases and licences with total transparency and by public auction, unless such procedures were stated to be impossible to undertake. Public servants were barred from taking up jobs with those organisations or companies with which they had been dealing in their official capacity. This was meant to prevent an insidious form of corruption whereby public officials would take jobs instead of bribes from the organisations that they had been patronising in their official capacity. After nine meetings, the government terminated its engagement with the civil society members of the joint drafting committee and went on to draft and table its own Bill in the monsoon session of Parliament. This Bill incorporated some of the provisions of the Jan Lokpal Bill but fell far short of what was required to even set up an independent and comprehensive anti-corruption investigative organisation. It left the selection of the Lokpal to a government-dominated committee. Though powers for the removal of Lokpal members were vested in the Supreme Court, complaints against the Lokpal could only be made by the government, which retained the power to suspend them. The government’s Bill removed most public servants from the jurisdiction of the Lokpal, including the Prime Minister, MPs (insofar as their corruption pertained to their actions in Parliament), judges, and Class 2, 3 and 4 officers. Instead, it brought lakhs of NGOs (even those which were not funded by the government) within its jurisdiction. Though the Bill kept the CBI with the government, it allowed the Lokpal to have its own anti-corruption investigative body. It eliminated the need to get prior sanction for investigation from the government. It provided for the confiscation of the assets of corrupt public servants and the recovery of losses caused by their acts of corruption from them. But it created a terribly cumbersome procedure for investigation, by which a preliminary inquiry and hearing of the corrupt public servant were made compulsory before investigation could begin. This ended the possibility of making surprise raids and seizures on the premises of corrupt public servants or their abettors. Anna Hazare announced his second round of fasting in protest against this Bill, from August 16. This brought lakhs of people on to the streets across the country, and eventually forced the government to convene a special session of Parliament, where Anna’s three minimal demands were accepted by a unanimous Sense of the House resolution. Thus, all government servants and the citizens’ charter were to be brought under the Lokpal’s jurisdiction. 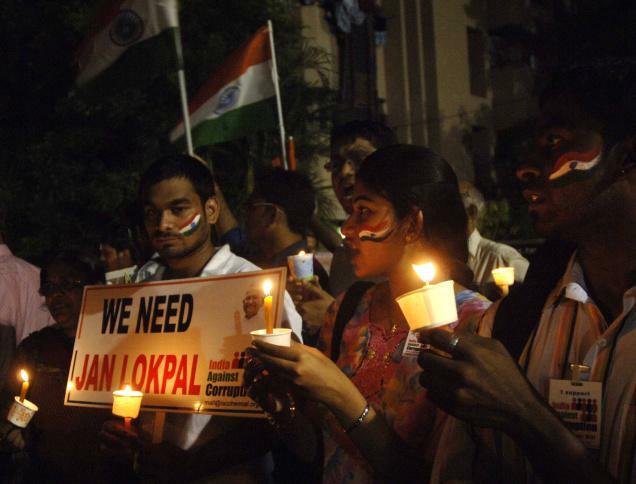 The Bill would provide for Lokayuktas in the States on the same model as the Lokpal. The government promised to bring forward and pass such a strengthened bill in the winter session of Parliament. Thereafter, the Bill was referred to the Standing Committee of Parliament, which after three months gave a fractured report with many dissenting notes. The Bill, which was reintroduced towards the end of the winter session, not only did not accept the one useful suggestion of the Standing Committee (negating the compulsory step of a preliminary enquiry) but went on to eliminate even the investigative body from the Lokpal. Thus, the Lokpal would not only be selected and suspended by the government, it would also have to rely only on government-controlled investigative organisations for its investigation. Class 3 and 4 officers were still kept out of the Lokpal’s ambit. Those of us who worked on the mission with Anna Hazare had suggested 34 amendments to rectify the government’s Bill, and we pointed out that four of these were critical to making the Lokpal a workable institution. These were that the selection and removal procedure should be made independent of the government; the CBI should be brought under the Lokpal’s administrative control or, alternatively, the Lokpal should have its own investigative body; all government servants should be brought under the Lokpal’s investigative ambit; and the procedure for investigation should be in line with the normal criminal investigation procedure. But the government was adamant in not accepting any of these either, and went on to bulldoze the passage of its Bill. It rejected all the amendments moved by the Opposition. The Opposition moved several of the amendments suggested by us, but the only amendment that the government accepted was one to allow State governments to decide when the Bill would be applied to them. The Rajya Sabha witnessed a sordid drama. Several parties which had walked out in the Lok Sabha (the Samajwadi Party and the Bahujan Samaj Party) or had not moved any amendments there (the Trinamool Congress) moved amendments in the Rajya Sabha and their representatives delivered fiery speeches opposing the provisions of the Bill. When it became clear that at least three of the amendments (those relating to the selection and removal of Lokpal members, the CBI being brought under the administrative control of the Lokpal, and the deletion of the chapter on Lokayuktas in the States) were likely to be passed, the government engineered disturbances in the House, resorted to filibustering and prevented the amendments from being voted upon. And the House was prorogued with the Bill hanging in the air. The government was repeatedly telling us that by proceeding with protests while Parliament was considering the Bill, we were showing contempt for parliamentary democracy. We had responded by pointing out that by overlooking the wishes of the people as expressed in numerous polls, surveys and referendums, all of which showed that more than 80 per cent of the people favoured the Jan Lokpal Bill, the government was showing contempt for the people. The drama in the Rajya Sabha showed that the government was not even willing to go by the will of Parliament. This gives rise to fundamental questions about the functioning of Indian democracy. Is this form of representative democracy allowing the will of the people to be reflected in policy and law-making, or is it being held hostage to parties and their leaderships to be determined by their own whims or corrupt considerations? Has the time come for us to rethink and deepen our democracy by putting in place systems where laws and policies would be decided by decisive inputs of the people (through referendums and gaon sabhas, or village councils) rather than only by such “elected representatives”? We hope that this fundamental issue would bring about an even broader public engagement than what has been witnessed during this Lokpal campaign. How does the failure to confer constitutional status on the Lokpal affect the anti-corruption ombudsman? Such an anti-corruption ombudsman was earlier established in Haryana and Punjab through a legislative instrument, that is through an ordinary statute. But there were some political bigwigs who were involved in corruption and the Lokayukta was on the verge of catching them. What the government did then was it repealed the (Lokayukta) Act itself through an ordinance. This happened both in Haryana and Punjab. My apprehension is that if a political heavyweight is under investigation, and the ombudsman has been established through an ordinary statute, then a simple ordinance can be passed to scrap the whole institution. But if the body has constitutional status, then it can’t be amended like this. It would have been difficult to repeal the Lokpal had it been given constitutional status. Can the opposition argue that the minority quota in the Lokpal is unconstitutional? No. Consider Articles 15 and 16 of the Constitution. Nowhere do they talk about a Hindu, Muslim or Christian quota. What they say is that nothing will prevent Parliament from enacting a law for advancement of educationally and socially backward class of citizens and members of the scheduled caste. There’s no mention of religion. When you identify certain Hindu castes such as Yadavs, Kurmis, etc you don’t say ‘Hindus’ are getting reservation; you say they are backward groups and on this basis you give them reservation. Similarly, among the Muslim community you can identify certain backward segments and have a quota for them. So it’s not a question of religion but educationally and socially backward communities. Does the Lokpal Bill impinge on the country’s federal structure? Article 252 of the Constitution provides that in case Parliament doesn’t have the power to enact a law, it can on the request of the states make law for those states as well as whosoever is concerned with the law. Article 253 says that Parliament is empowered to enact laws for the enforcement of international treaties and UN conventions. For example, there is no legislative subject called human rights. But because we were a signatory to the UN Human Rights Convention, we enacted laws to establish the National Human Rights Commission. Similarly, the 2003 UN convention on fighting corruption empowers Parliament to make laws to tackle graft. It is on this basis that the Lokpal Bill has been introduced under Article 253. If the UN convention did not exist, then you could say the Lokpal Bill impinges on federalism. But not in this case. Is there any merit in the Team Anna argument that the CBI should be brought under the Lokpal? I don’t think that the entire CBI can be brought under the Lokpal. The CBI is a huge organisation whose investigative capabilities are used for so many things other than fighting corruption. At best you can put 50 or 60 CBI officers on deputation with the Lokpal. However, if the CBI is under the government and the government is the prosecutor, there is a clear conflict of interest in prosecuting government corruption. I believe the CBI should be autonomous in any case. Do you think the Lokpal can be a magic bullet against corruption? Not at all. Just like water finds its own level, people will find other routes to corruption. But the Lokpal can be a deterrent and create some fear in the minds of potential offenders. India is fast becoming like Pakistan — a society where bizarre conspiracy theories are plausible, credible, even highly probable. We no longer blame the CIA for floods or outbreaks of dengue. But there is reason to believe that the political process is being manipulated to ensure sinister outcomes that are not apparent. On the surface, the Lokpal bill is supposed to create an institution independent of the executive branch precisely in order to investigate and act against corruption, malfeasance and wrongdoing of members of the executive — be they elected politicians or unelected officials. But dear reader, do not get misled. The hidden purpose of the present Lokpal bill is to undermine the independence of the judiciary, which, in recent times, has been one of the few checks on the executive branch. The 50 per cent quota requirement for the Lokpal virtually ensures that the Supreme Court will strike down the law as it has been enacted. The Supreme Court has no choice if it goes by the doctrine of judicial precedence given its own past judgments restricting quotas to less than 50 per cent. The introduction of a “minority” quota makes the situation even more awkward for the Supreme Court and almost inexorably sets up a conflict between the judiciary and the legislature. Linguistic and religious minorities are referred to in the Constitution only with respect to rights in the cultural and educational sphere. For instance, they can run schools and colleges with taxpayer support but without government interference. Incidentally, many are not aware of the provision for linguistic minorities as the expression “minority” has now become one used only on a religious basis in common parlance. By this token a Gujarati is a member of a “minority” community in Maharashtra and a Marathi-speaker gets the same position in Gujarat. Linguistic minorities have the same “cultural” rights under our constitution that religious ones do. However, and this is significant — there is no mention of reservations or quotas for “minorities” in the Constitution apropos of government appointments. The non-majoritarian and secular nature of our Constitution was best described by Justice Santosh Hegde in his intervention from the bench during the Keshavananda Bharati hearings. He said that our Constitution is secular in spirit without ever mentioning the word “secular”. This was of course before the completely illegitimate amendment made to the Constitution’s preamble by Parliament. The preamble was a mere statement of historical fact — that “we gave ourselves” a Constitution that came into effect on January 26, 1950. How can amendments be made at a later date to a historical fact? Once the Supreme Court strikes down the Lokpal bill as it undoubtedly will, the stage will be set for a “popular” movement against the judiciary. Political workers will be brought into Delhi from neighbouring states. There will be public “pressure” on the government to bring under its “control” the recalcitrant “anti-minority”, “anti-reservation” court. Selected ministers of the government will start attacking the judiciary for being reactionary and for not understanding the wishes of the masses. The government will then try to overturn the present collegium-based appointment of judges of the higher judiciary and re-establish cabinet control over these appointments. Given our penchant for political amnesia, no one will remember that the collegium-based approach was a desperate one forced on the judiciary because of the arbitrary process used earlier by the government of the day to pick and choose as judges and as the chief justice individuals who were “pliable” and “committed” (presumably to the executive, not necessarily the Constitution). Cabinet ministers can conveniently recycle the thoughts of an earlier law minister, the authoritarian H.R. Gokhale, who felt that judicial independence was an undemocratic, reactionary legacy. Our collective amnesia will also ensure that we forget that most of the legislature versus judiciary conflicts in the past were due to badly drafted (need I say, probably deliberately badly drafted) laws and ordinances, precisely like the present Lokpal bill. The hastily introduced “Bank Nationalisation Ordinance” of 1969 was struck down not for the act of nationalisation but because of the inclusion of inconsequential clauses on shareholder compensation and on the rights of erstwhile shareholders to freely engage in any business which remained their right under the Constitution. The even more hastily drafted ordinance “derecognising” maharajas was the result of the government of the day failing to win the vote for the bill in the Rajya Sabha. This was also struck down. In neither case had the Supreme Court shown any pro-rich or pro-maharaja bias. The court had merely struck down absurd self-contradictory clauses in the enactments. But the publicists of the self-styled left-liberal government of the day went to town accusing the judges of being reactionary and anti-poor. This set the stage for wholesale arbitrariness and political chicanery in judicial appointments. The Supreme Court’s “collegium” solution was a belated response to the shabby prevarications of the executive. We can predict, as night follows day, that once the Lokpal bill is struck down, as it probably will be, we will have an open season in terms of attacks on the judiciary and the beginning of the emasculation of this constitutionally independent institution. Dear reader: the purpose of the deliberately badly drafted Lokpal bill is now clear. The purpose is not to create an “independent” Lokpal. The sinister purpose is to undermine our “independent” judiciary. Independent institutions like the Supreme Court, the Election Commission, the Comptroller and Auditor General, the non-political armed forces and the Reserve Bank of India have saved India from becoming the home of real or imagined “conspiracies”. But don’t be surprised if this situation is now primed for change. The historical precedents and our amnesia do not suggest an optimistic prognosis. The debate on the Lokpal bill has thrown up three propositions about the CBI. One, retain the status quo; two, transfer the control to the Lokpal; and three, make the CBI an independent organisation. The CBI is now governed by an outdated act of World War II vintage, called the Delhi Police Establishment Act, which was enacted in 1946 to regulate the functioning of the Special Police Establishment. Section 4 (1) of this act vests the superintendence of the CBI in the Central government, just as Section 3 of the police act of 1861 vests the control of the state police force in the state government. Since the word “superintendence” has not been defined in any law, both the Central and state governments have misused police forces to serve their partisan interests. There is a general perception that the CBI, like other police forces in the country, is influenced in its work by political considerations. Can any government ever think of making the CBI an independent organisation? If one plays the devil’s advocate, one can think of two arguments that the Central government can cite in favour of retaining its control over the CBI. First, any police force, including the CBI, is a part of the executive, and in the Westminster model of governance that we have adopted, the minister concerned is responsible to Parliament for the efficient and honest functioning of his departments. Second, the police, including the CBI, enjoys tremendous powers and it is important for the government to ensure these powers are used judiciously. While the first argument can be considered valid, the second can be contested. It is true that in a democratic system, police powers need to be controlled to prevent their misuse, but then it has to be realised that controlling the police itself becomes a source of tremendous power that can be misused to serve partisan interests, as has happened so frequently in this country. What is needed is to set up institutions and mechanisms to balance these two requirements. In the judgment on the hawala case, the Supreme Court tried to make one such attempt. While the court transferred the responsibility of exercising superintendence over the CBI’s functioning from the government to the Central Vigilance Commission (CVC), it simultaneously held that the concerned minister should be ultimately responsible for its efficient functioning to Parliament. The court maintained that none of the minister’s powers could extend to interfering with the course of investigation and prosecution in any individual case. Investigation is to be governed strictly by the provisions of law. Unfortunately, the government did not implement the judgment of the SC either in letter or in spirit. The Central Vigilance Commission Act of 2003 derailed the judgment in three important ways. One, it resurrected the Single Directive despite the fact that the court had held it null and void, being bad in law. Two, it did not transfer superintendence to the CVC fully. The CVC Act 2003 prescribed that the CVC shall exercise superintendence not over the CBI but over the Delhi Special Police Establishment (DSPE) only, regarding cases registered under the Prevention of Corruption Act 1988. Third, in exercising superintendence over the organisation, the government did not keep itself within the boundaries as defined in the judgment. The possibility of misuse of the police by the government of the day has caused concern in other countries too. They have found solutions by developing traditions of good governance and setting up new institutions. The UK seems to have successfully implemented a very subtle distinction between the police as an organisation and policing as a set of activities. While the police as an organisation is the responsibility of the government, policing as a set of functions is the responsibility of the head of the police force. Government’s role is to formulate policies, provide budget, set standards and monitor performance, but it cannot give any operational direction to the police chief. The police acts in some other regions and countries have dealt with this problem by clearly defining the role and responsibilities of the government and the police department. In Queensland in Australia, communication between the minister and the commissioner of police is guided by clear provisions of the police act. Directions from the minister have to be in writing and the commissioner of police is bound to comply with the directions, but keep a record of all correspondence, which is later placed on the floor of the assembly. In India, there could be mechanisms and institutions that will ensure the CBI’s functional autonomy, as no government will ever agree to relinquish its control over an organisation like the CBI. Also, the Lokpal could have its own independent investigating agency, which need not necessarily be the CBI.